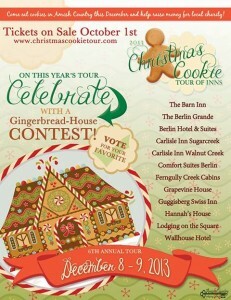 What is a cookie tour, you might ask. Well, I’m glad you asked. A dozen local Inns, B&Bs, and one log cabin lodging place, (Ferngully Creek! ), will be featured on the tour. Ticket-holders are entitled to visit each establishment on either December 8th or 9th during the tour hours where they will be served refreshments as well as receiving a specialty cookie from each place. This year’s theme is gingerbread and several Inns will have gingerbread houses on display from Dr. Learner, famed for his amazing creations. Students from the University of Akron will be competing for the honor of building the best gingerbread house and their entries will be featured as well. The winners will be eligible for prize and/or scholarship monies. Don’t miss this chance to visit beautiful Holmes County during the holidays and enjoy the festivities of the tour! (In the event of severe weather with road condition level warning in the area, one or both days of tour may be postponed to the following weekend.